George H.W. Bush was America's closer. Called in to pitch the final innings of the Cold War, Bush 41 presided masterfully over the fall of the Berlin Wall, the unification of Germany, the liberation of 100 million Eastern Europeans and the dissolution of the Soviet Union into 15 independent nations. History's assignment complete, Bush 41 was retired. And what happened to the world he left behind? What became of that world where America was the lone superpower, which 41 believed should lead in creation of the New World Order? The Russia that back then was led by Boris Yeltsin, a man desperate to be our friend and ally, is now ruled by an autocratic nationalist. Was not Vladimir Putin an inevitable reaction to our treating Russia like an untrustworthy and dangerous recidivist, by our expansion of NATO into the Balkans, the eastern Baltic and the Black Sea -- the entire front porch of Mother Russia? Did the America that in her early decades declared the Monroe Doctrine believe a great nation like Russia would forever indulge the presence of a hostile alliance on her doorstep led by a distant superpower? In this same quarter century that we treated Russia like a criminal suspect, we welcomed China as the prodigal son. We threw open our markets to Chinese goods, escorted her into the WTO, smiled approvingly as U.S. companies shifted production there. Beijing reciprocated -- by manipulating her currency, running up hundreds of billions of dollars in trade surpluses with us, and thieving our technology when she could not extort it from our industries in China. Beijing even sent student spies into American universities. Now the mask has fallen. China is claiming all the waters around her, building island bases in the South China Sea and deploying weapons to counter U.S. aircraft carriers. Creating ports and bases in Asia and Africa, confronting Taiwan -- China clearly sees America as a potentially hostile rival power and is reaching for hegemony in the Western Pacific and East Asia. And who produced the policies that led to the "unipolar power" of 1992 being challenged by these two great powers now collaborating against us? Was it not the three presidents who sat so uncomfortably beside President Donald Trump at the state funeral of 41? Late in the 20th century, Osama bin Laden declared war on us for our having planted military bases on the sacred soil of Mecca and Medina; and, on Sept. 11, 2001, he made good on his declaration. America recoiled, invaded Afghanistan, overthrew the Taliban, and set out to build an Afghan regime on American principles. 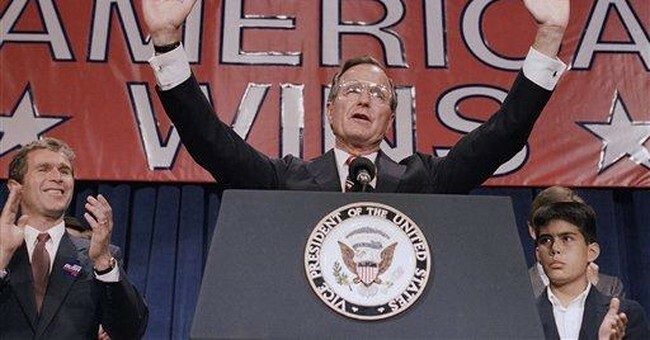 Bush 43, declaring that we were besieged by "an axis of evil," attacked and occupied Iraq. Then followed our attack on Libya and support for Saudi Arabia's war to crush the Houthi rebels in Yemen, a war that many believe has surpassed Syria as the world's worst humanitarian crisis. Where are the fruits of our forever war in the Middle East that justify the 7,000 U.S. dead, 60,000 wounded and untold trillions of dollars lost? Since George H.W. Bush left the White House, the U.S. has incurred 12 trillion dollars in trade deficits, lost scores of thousands of manufacturing plants and 5 million manufacturing jobs. Our economic independence is ancient history. After 41 left, the Republican Party supported an immigration policy that brought tens of millions, mostly unskilled and poor, half of them illegal, into the country. Result: The Nixon-Reagan coalition that delivered two 49-state landslides in the '70s and '80s is history, and the Republican nominee has lost the popular vote in six of the last seven presidential elections. From 1992 to 2016, the American establishment contemptuously dismissed as "isolationists" those who opposed their wars for democracy in the Middle East, and as "protectionists" those who warned that by running up these massive trade deficits we were exporting America's future. The establishment airily dismissed those who said that pushing NATO right up to Russia's borders would enrage and permanently antagonize a mighty military power. They ridiculed skeptics of our embrace of the Chinese rulers who defended the Tiananmen massacre. The establishment won the great political battles before 2016. But how did the democracy crusaders, globalists, open borders progressives and interventionists do by their country in these decades? Did the former presidents who sat beside Trump at National Cathedral, and the establishment seated in the pews behind them, realize that it was their policies, their failures, that gave birth to the new America that rose up to throw them out, and put in Donald Trump?